Shares of Chevron (NYSE:CVX) continue to gush higher on the heels of a historic stock market rally to start the year. CVX stock is now up over 15%, and despite the rout in oil prices over the past year, Chevron is actually higher over that time frame. Valuations are starting to look stretched, however, on both an absolute and comparative basis. Technicals are looking rather extreme as well. What does it all mean? The red hot rally in Chevron is running on fumes at current levels. Chevron stock is beginning to look a little pricey on a comparative P/E basis. CVX just eclipsed a 16 multiple, presently sporting a P/E of 16.26, the highest level of the year. The last time Chevron carried such a comparatively rich multiple was early last October, right before shares plummetted from $125 to $110. CVX stock is also trading at a large premium to crude oil, as seen in the chart below. 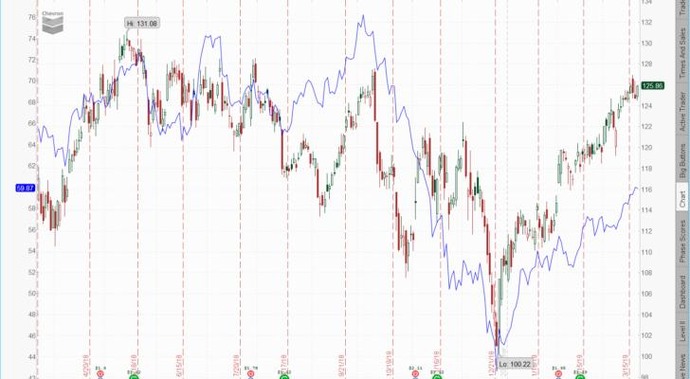 Normally, Chevron is highly correlated to the price of crude, which makes sense given that it is one of the world's largest oil companies. Lately, however, that correlation has broken down, with the gains in CVX far outpacing those of oil. I look for that correlation to begin to revert, with Chevron stock being a relative underperformer to crude over the coming weeks. Given my outlook that crude is looking toppy at the $60 area, further gains for CVX may be difficult to come by. Important to note that the last time Chevron traded near current levels, crude was at $75, not $60. CVX stock is also looking a little extreme from a technical perspective. Shares are approaching major resistance at the $128 level after a major rally. 9 day RSI just breached a 75 reading before weakening. Previous times Chevron was this overbought marked significant intermediate-term tops in the stock. Implied volatility (IV) is also near trough valuations, a usually reliable bearish indication of over complacency. Chevron looks extended on both a fundamental and technical basis and should be a viable short candidate on any rally. Earnings are in early May, as is the ex-dividend date. Traders looking to avoid these risks should close the position out prior to then to lessen the risk. Options traders may look to take advantage of comparatively cheap implied volatility and take a defined risk short position by going long the April $125 puts for under $2.00. The intrinsic breakeven point of $123 equates to just a 2.2% pullback in Chevron stock. The post The Rally In Chevron Stock Is Running Out of Gas appeared first on InvestorPlace. The following are just a few of this past week's most bullish and bearish posts that may be worth another look. See which top analyst called the latest Chevron Corporation (NYSE: CVX) acquisition a "win-win" deal for shareholders, according to Wayne Duggan's "Wall Street Weighs In On Chevron Following Anadarko Deal." "Buckingham Lifts United Continental Outlook, Price Target After Q1 Beat" by Priya Nigam discusses why the prospects for United Continental Holdings Inc (NYSE: UAL) look good despite the Boeing Co (NYSE: BA) 737 MAX grounding.